It is too early to tell whether the program is working over all, but an analysis of city parking data by The New York Times found signs that the new rates are having the desired effect in some areas. While only a third of the blocks in the program have hit their targeted occupancy rates in any given month since the program began, the analysis found, three-quarters of the blocks either hit their targets or moved closer to the goal. The program is a bit more successful on weekdays. 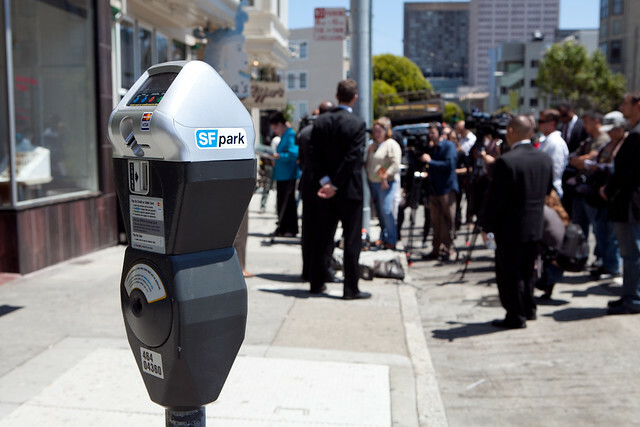 Cities around the country continue to set their sights on SFPark, eager to see what conclusions come out of the groundbreaking parking management program. Assuming the early indications hold up and Donald Shoup’s theory is borne out in practice, cities plagued by cruising traffic will find SFPark’s data incredibly valuable in emulating San Francisco’s success. Unfortunately, the nation’s leader in parking innovation has a dirty little secret: it still doesn’t allow SFPark to operate on Sundays or evenings, and until it does, there will be a major gap in the data. The sensors do still operate at night, and what they show is that a lot of the parking fills up as soon as it becomes free and stays full until late at night or the next morning. I’m glad we finally have data to back up we have all known all along. Businesses open after the “free” period starts should be clamoring for extending the meters to increase turn over. And it doesn’t allow pricing above $6 per hour, though there may be locations where the market price is above that. If it remains hard to park in those locations, this will be touted as a failure of SFPark’s market pricing policy, though it is actually a failure to allow market pricing. Can anybody answer the following question? If SFPark is extended to all metered spots in the city, will all meters be converted into “Smart Meters”? And another question: Where can one find documentation of the SFMTA raising AND lowering parking rates based on occupancy data? I ask because there seems to be an incentive for the SFMTA to continue with the old meters and the fixed pricing in areas that are not so popular for parts of the day. This way the agency gets more revenue from meters and from giving out tickets. For example, near my apartment there are stretches of unused metered spots with the old style of meter during certain times of the day/week. The cost to park there is constantly $2/hour, and during less popular times, drivers park in unmetered, neighborhood spots and leave the metered ones empty. The few cars in the metered spots, however, are regularly patrolled by the meter maids handing out the random ticket to a parked car with six empty spots around it. The reports on past price adjustments, both up and down, are at http://sfpark.org/how-it-works/pricing/ and the current price for each parking space is also available when you query the API. I don’t know anything about on what schedule you can expect existing meters to be replaced with SFPark ones though. By the way, I don’t know how the New York Times is getting the figures they are for the 200 block of Drumm Street. The daytime occupancy returned by the API bounces up and down and I can’t see anything resembling a clear trend. Eric Fischer, Thanks for the website.